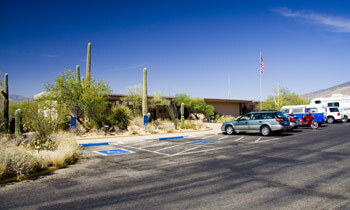 This is a very attractive visitor center with spectacular views of mountains and Saguaros right from its back porch. 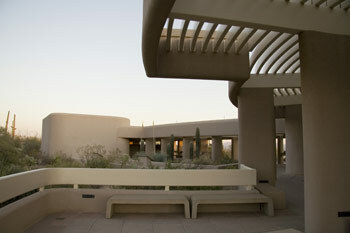 The visitor center has cultural and natural history exhibits of the Sonoran Desert. You can see a 15 minute program called "Voices of the Desert", giving a Native American perspective of the Sonoran Desert. There is also a great bookstore run by the Western National Parks Association. Various Ranger guided programs are held throughout the year. During the Winter months (November to mid-April) several different programs are offered daily. Call the visitor center to ask what is available that day. For directions to the Red Hills Visitor Center in Saguaro West go to my Maps and Directions page. 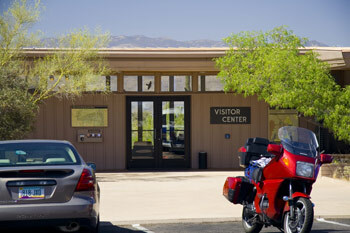 The visitor center at Saguaro East is smaller and more rustic. There is an interesting and well done exhibit just outside the center that walks you past about 15 major plants that live in the Sonoran Desert. You can see the living plant and plaque with a name and description of each plant. I highly recommend looking at this. A brief (15 minute) program called "Voices of the Desert", is shown throughout the day. It explores the Native American viewpoint of the Sonoran Desert. There is also a Western National Parks Association Bookstore here. There are several Ranger guided programs offered throughout the year. Some program are available daily during the cooler Winter months (November to mid-April). 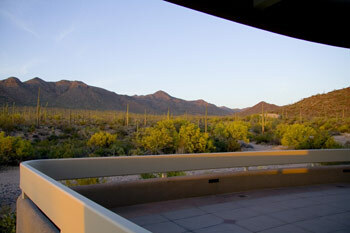 Call the Saguaro East Visitor Center for availability during the year. 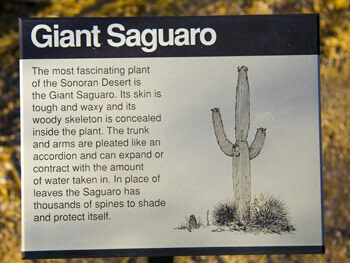 For directions to the Saguaro East Visitor Center look on my Maps and Directions page. ©2006-2017. All rights reserved. This website is not associated with the National Park Service or any Government Agency.